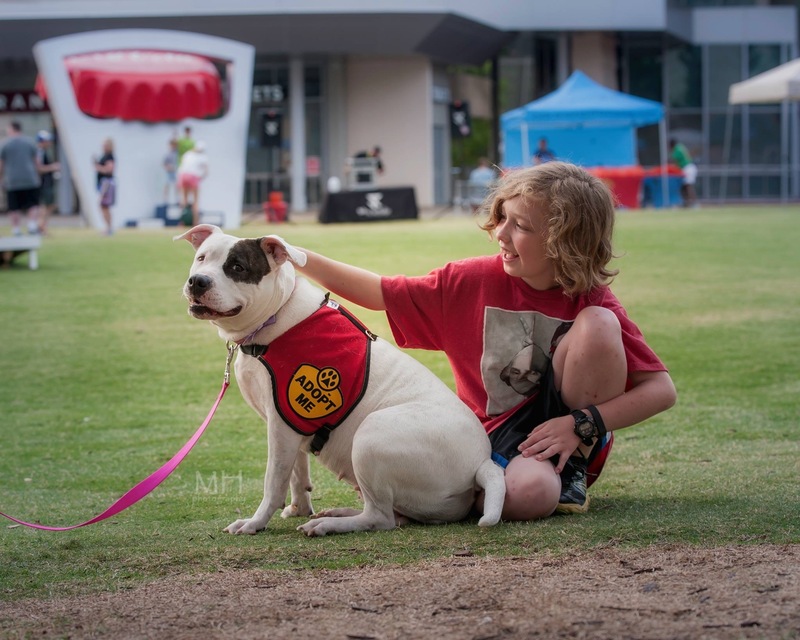 … is a volunteer-based 501(c)3 charity and dog rescue group founded in August of 2015. We rescue dogs of all breed and all ages. Our organization is located in Woodstock, Georgia and we adopt our dogs to pre-approved homes in all areas. … to save responsibly as many dogs as we can from high kill shelters and to find them forever homes. … to educate the public about animals in high kill shelters throughout Georgia and the responsibilities involved with pet ownership, such as spay/neuter, heartworm and flea prevention, and vaccines. Contact us today at (678) 250-DOGS (3647). Find your perfect companion at Refuge Rescue! Take your best friend home today! Without fostering, there can be no rescue. Provide a helpful hand to an animal in need! Learn what fostering involves and complete your application today! Our success depends on your generosity! Every little bit counts! Click here to make a tax-deductible contribution. Whether working an adoption event or assisting in animal care, your help allows us to continue to rescue! Learn more where you can lend a hand. Puppy Mill Horrors! We Need Your Help! We had an extremely exhausting, exasperating and emotional roller-coaster of a weekend March 2nd/3rd. 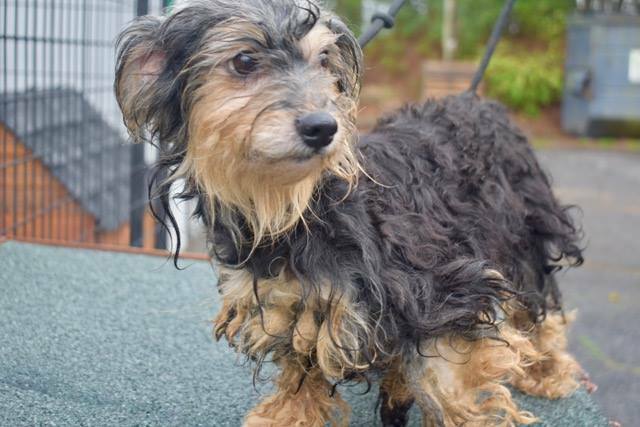 You may have heard the news of the hoarder/puppy mill situation in South Georgia that resulted in more than 700 small breed puppy mill dogs being released and moved to rescue groups throughout the region. We are one of those rescue groups. 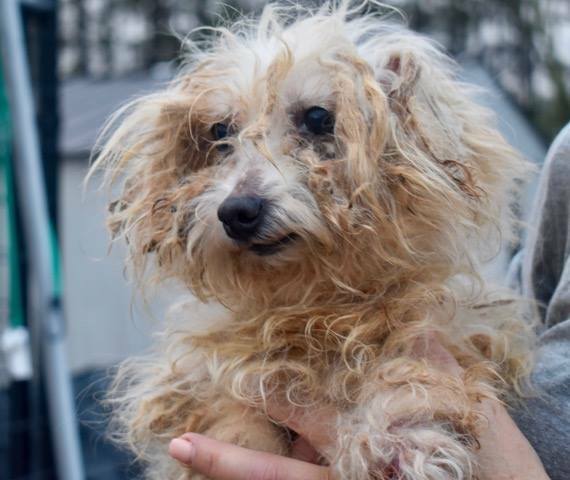 We accepted 15 neglected, emaciated, matted, precious souls into our program! We were told these dogs were in a warehouse, living in crates their whole lives – crates upon crates, stacked on top of each other, from floor to ceiling, with several dogs in one crate. When they arrived, they reeked of filth — feces and urine and mildew and bacteria trapped inside thick mats of fur… some as large as tennis balls. Their skin and feet are urine scalded. They all have dental disease. They are all emaciated. We did an initial bath, groom, and de-flea as we started their intake process…It will take much more work to get several of them completely mat free. We expect their medical costs will be extensive. As you likely know, we just rescued 12 death row puppies, so our resources are beyond stretched. The last thing we needed to do was to accept high medical needs dogs into our program. But when we heard of the horrors these dogs experienced – for so many years – every single day of their lives, we had to help. These precious souls deserve the very best, and we are committed to ensuring they wind up with dream homes and happy futures. As we have worked through the intake process with each one, evaluating and bathing them – and then creating space for them in our kennel, we’ve moved through a mix of emotions – from disgust to sadness to sorrow to anger… and then, eventually to a little bit of happiness as we could clearly see and feel their relief at being in a quiet place probably for the first time ever, being clean for possibly the first time ever, feeling terrified yet, somehow knowing they were in a better place. Seeing their tails wag and receiving their sweet thank-you kisses… there definitely were tears on our part. We’ll be christening them with names, having them vet checked and working to gain their trust. We’ll be posting updates on their progress and introducing them to you individually soon. We need your support to continue to help them. Their dental and other medical issues will be very costly to treat. Donations are needed to assist with veterinary care and the overall wellness of the dogs. We’ll need fosters soon, too. Credit card – click here. Directly via PayPal – click here. Are you looking to adopt a dog? We have a variety of dogs that are ready for their forever home. Visit us on May 5th from 11 am until 3 pm at our adoption event at PetSmart at 142 Woodstock Square Ave in Woodstock, Georgia 30189. 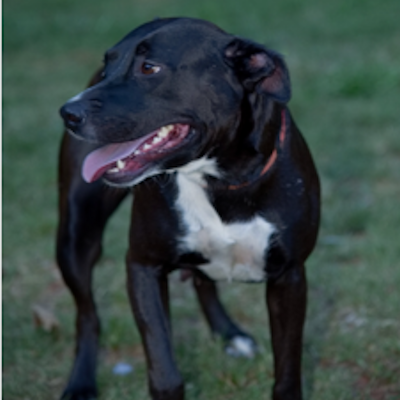 Leela is a 4-year-old active dog who has been with Refuge Rescue for several months. She currently lives at our kennel facility but would love to have her own home. She loves to be around people and with a proper introduction, she gets along with dogs. Leela loves nothing more than to go on walks and lean up against you for attention and stomach rubs. Please consider adopting Leela. And if you don’t have the space open, maybe you can foster her temporarily until her forever family finds her. Click here to learn more about Leela. 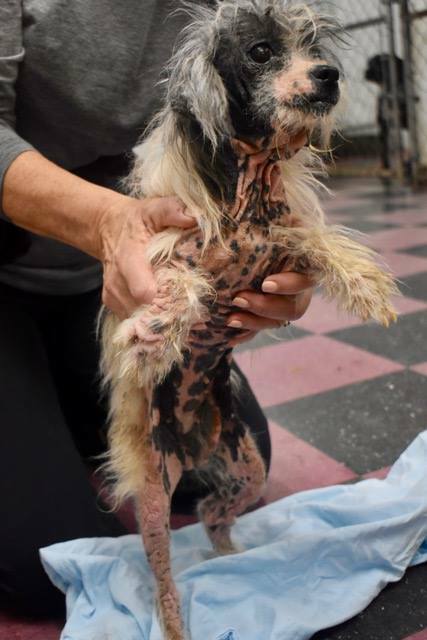 When Tess came to us with the rest of the puppy mill dogs we rescued in March, our initial impression was that she appeared to be in much better shape than most of the other mill dogs. 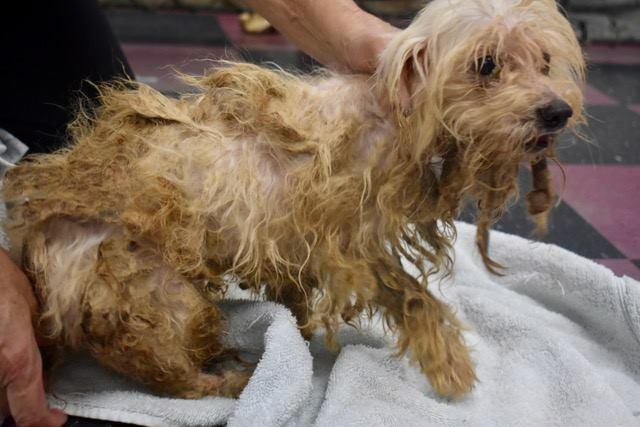 Sure, she was emaciated, and it took several baths to remove the fleas, urine and feces from her coat. But once she was cleaned up, under all that former yuck, we found a pretty chihuahua – chocolate with white on her chest, face and feet. Our initial check-in\\ intake evaluation listed her as a senior with dental issues that would likely need dental surgery and extractions. She was very skittish and shy, untrusting of humans – and quite nervous. She just wanted to hide and would panic if her crate was left near the middle of a room without a cover “for protection”. But – overall, we felt she’d come around with love and patience. And, if all she needed was dental work, she was way ahead of most of the others health-wise! That’s what we were hoping, anyhow. Tess has made small strides socially with people. It still takes her a good while to get used to new people, but she’d never known a gentle touch or kindness, so we expect it to take time for her to learn she’s in good hands know and that she can trust she’ll be treated well. You can still see her fear and panic if you enter the room too fast or bend down to pick her up too quickly. Once in your arms, she’ll usually settle and relax briefly– as long as there’s nothing else ‘disturbing’ going on. But if there’s a loud or unexpected noise or motion, the panic will set in again. She has the puppy mill version of PTSD. Just touching her or coming near her too fast can trigger unpleasant events from her past. Her eyes hold so much bottled up emotion, so much pain and fear of the unknown – and the known. If you sit quietly and watch her, it takes so long for her to go to sleep. She’ll finally pass out from sheer exhaustion from nervousness. If she does reach a deep sleep, she begins heavily panting and the intensity of the panting progresses. She’ll cry out and whimper -, and then suddenly she’ll jump up and pace nervously. We feel helpless and powerless but know it will just take more time for her to learn that things are going to be okay now, that she’s safe and that there’s no need for fear any more. At her first vet visit, our vet estimated Tess to be 7 years old and her bloodwork showed a high platelet count, likely due to overall infection. She had grade 3 dental disease and needed lots of dental work. Her eyes were in poor shape; she has healed corneal ulcers and scarring due to untreated bacterial and fungal infections. 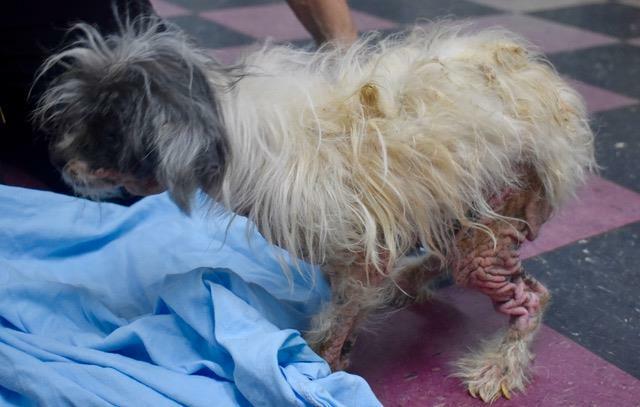 We treated her for the infection, got her on some excellent food – and waited for improvement so that we could move forward with her dental work. That’s when the unexpected happened. A volunteer was cuddling Tess when she became frightened and jumped off her lap. For any other dog, this likely wouldn’t have been a problem. But due to a lifetime of malnutrition and neglect, Tess didn’t handle the jump well. She started limping on her front leg. X-rays revealed three displaced fractures of her metatarsals and she needed surgery! Some of the fractures appear to be old but, in any event, Tess needed those bones to be realigned and she’s in a splint now. She’ll need a follow-up recheck in several weeks, and if the splinting is not successful, an orthopedic surgeon will have to put tiny pins in each fractured metatarsal and secure them with screws. They are tiny thin bones, so if required, it will be a delicate surgery. On a happier note, Tess is in a very temporary medical foster home. We put her with a couple of tiny, small breed puppies and she wants to be with them, sleep with them – and look after them. This is the happiest we’ve seen her! Baby steps. (We get a little teary when we watch her with them). Tess has now been spayed and most of her teeth had to be extracted due to severe dental disease. She is recovering well though. So far, our discounted costs for Tess are over $2,600 – and she’ll still need more follow-up support. We’re hoping she’ll be able to avoid the orthopedic surgery, but we won’t know for several more weeks. Please donate to help with her care - and SHARE her post.